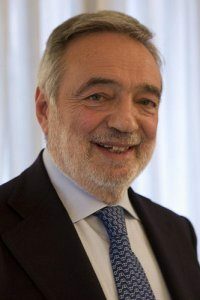 Luigi Nicolais, current president of the COTEC Foundation for Technological Innovation and Member of the Board of Milano-Bicocca, is Emeritus Professor of Technology of Materials at the University Federico II of Naples and President of Real Foundation of Carditello Site. He founded and directed numerous research and technology transfer departments and he is member of various scientific associations. He authored over 500 publications, 10 monographs, 1 encyclopedia, 25 patents. He is among Italians scientists with the highest number of citations and he is member of the Editorial Board of the most important international journals. He was Regional Minister for Research, the University and Innovation; Minister for Reforms and Innovation in the P.A. ; Vice President of the Cultural Commission of the Chamber of Deputies; President of CNR .